Finally another sighting of those rare nacreous clouds. More on flickr . Is this related to the northern light effect? No, not linked at all. Northern lights are caused by particles from the Sun, while this type of clouds is still unclear what it actually is. NASA just launched a mission to found out more about it (http://en.wikipedia.org/wiki/Aeronomy_of_Ice_in_the_Mesosphere). 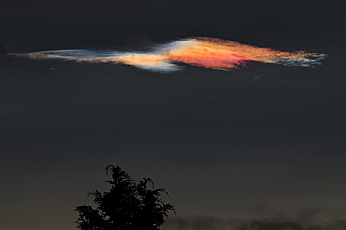 Nacreous clouds or mother of pearl clouds will only be seen just after sunset or before sunrise, they form in the stratosphere at heights of between 6-18 miles when the temperature there falls below -80°C and are ‘probably’ composed of ice particles with a liquid coating of nitric acid tri-hydrate. They appear bright because they are high enough to be illuminated by the sun long after local sunset and the pastel colours arise through diffraction or interference effects in much the same way that colours appear in a film of oil on a puddle of water. Aurora borealis (northern lights) & aurora australis is the emissions of photons in the Earth's upper atmosphere & not connected to these clouds formations.